My seating area, for the front row is in the 12-13 foot range from the wall. My ceiling height is 89" and 81" where the HVAC ducts hang down in the center for the room. Seats: four Berkline recliners composing the single seating row and a card table and chairs behind. Audio System: 7.8.4 - Denon AVR x7200wa, Sherbourn PA 7-350 amplifier powering bed speakers, ceiling speakers powered by Crown XLS-402 (4 speakers wired to output top middle L/R pair), front wides powered by AVR. Speakers: - (13) JBL CBT70J-1 in a 9.2.2 source setup in a 9.8.4 speaker layout. Post 1870-1990 range has some good pictures and measurements of the JBL. 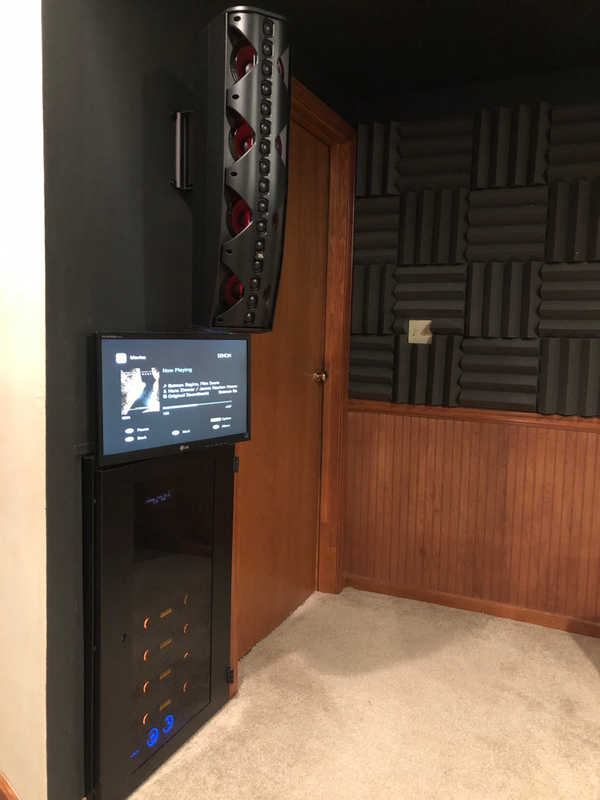 Version 1.0: (2) JTR Captivator Pros - these are incredible subs - I expect it takes me six UM18-22 subs in sealed cabinets to match the pair of JTR Captivator Pros I had. But I think 8 sealed UM18-22 got the slight nod. Walls painted Olympic One Black Magic matte paint from Lowes. I enjoy playing games, HTPC use, and watching movies or listening to music. I typically listen to music casually instead of critically. I don't wear the brand of audiophile, instead I'm an enthusiast who is willing to try new things to learn about the hobby. I'll call a spade a spade. As a volume preference, I watch movies at about -12 dB with the bass ~10-15 dB hot. I like the bass hot by about 12-24dB for music listening. Ground Zero: - started with a finished basement in a 1985 built house we bought in 2014. Here's a real estate ad photo at the time we bought the house. The house was on the market as a Bank Foreclosure. 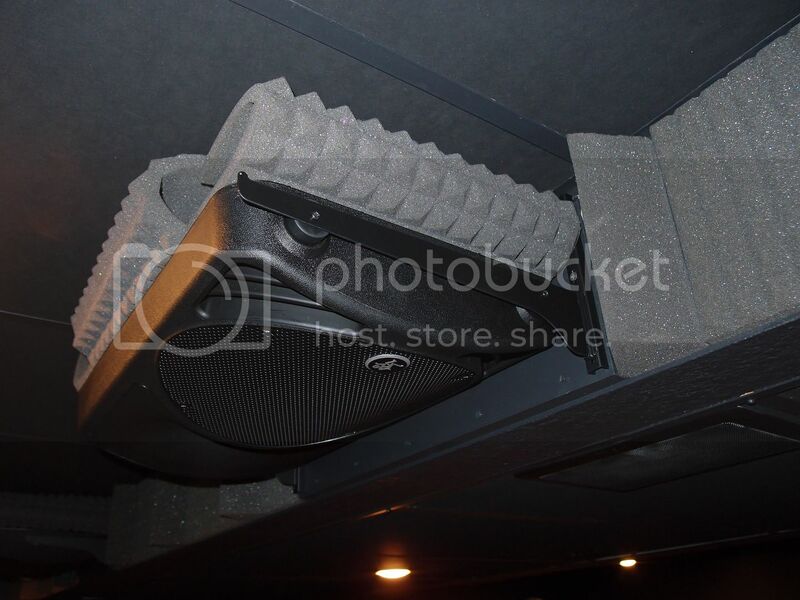 2014 - (3) JTR 228HT, LCR (4) Mackie C200 surrounds, (2) Sony Spasato in-ceiling, and (2) JTR Captivator ported subwoofers in 7.2.2 configuration. Version 3.0 - 2019 - (13) JBL CBT70J-1 with DIY RGB 5050 LED Strips installed behind the tweeter array, and still the same (8) UM18-22 sealed subwoofers in a 9.8.4 configuration. Version 3.0 configuration information starting around post range 1870-1990 for obtaining, fixing crossover issues, installing RGB LED lighting, and installing speakers. 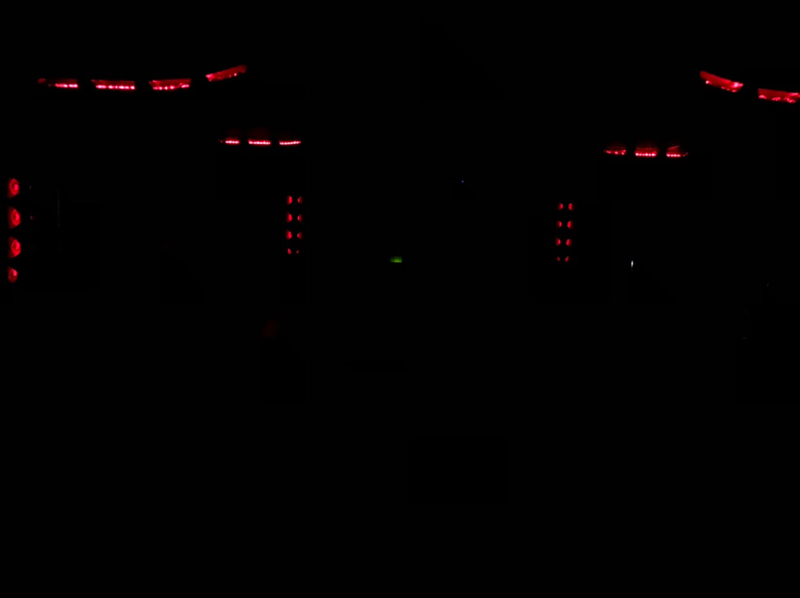 This one is at 5% on red only which is dark enough to use during movies with no negative impact to the image. Scott Simonian, chirpie, darthray and 11 others like this. Last edited by Archaea; 03-29-2019 at 04:35 PM. 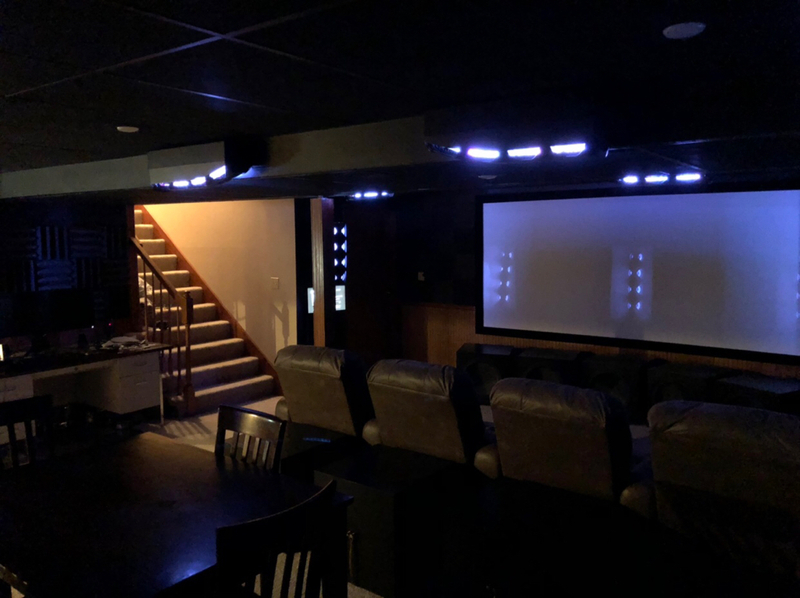 I've moved to a larger home, and the new basement space needs to be outfitted with my existing theater equipment. I'm looking for suggestions on the best way to go about this on a tighter budget than many of the dedicated spaces I see on these forums. I love many of the designs I see, but this won't really be a dedicated space. It will be a multipurpose space. Of all the theaters I've been to I think Craig John had some of the best acoustical treatments I've heard yet - at least to my ears. His theater concept was similar to my intent in that he had about half the basement as a multipurpose room with the screen up front on one side and a card table in back for multipurpose use. He said his theater was designed on a dead front/live back concept that is an older acoustical design concept, but I really liked the way it sounded for both movies and music. My room is basically a sandbox, so no option is really off the table. My wife gave me the go ahead to do most anything I want with it - as long as it is reasonably affordable. So I'd like to consider all suggestions. 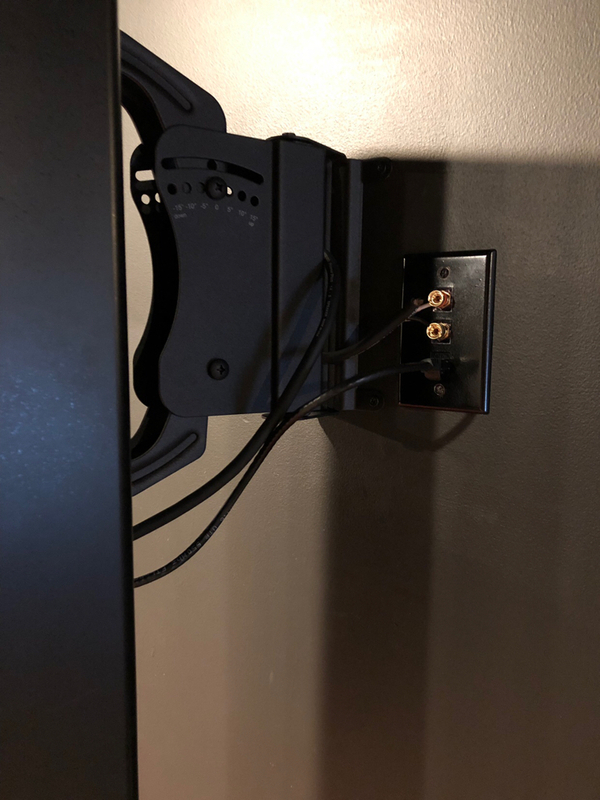 What I'm initially thinking is a 2:35:1 AT projector screen built into the storage room wall and using the storage area to easily house/baffle the speakers. 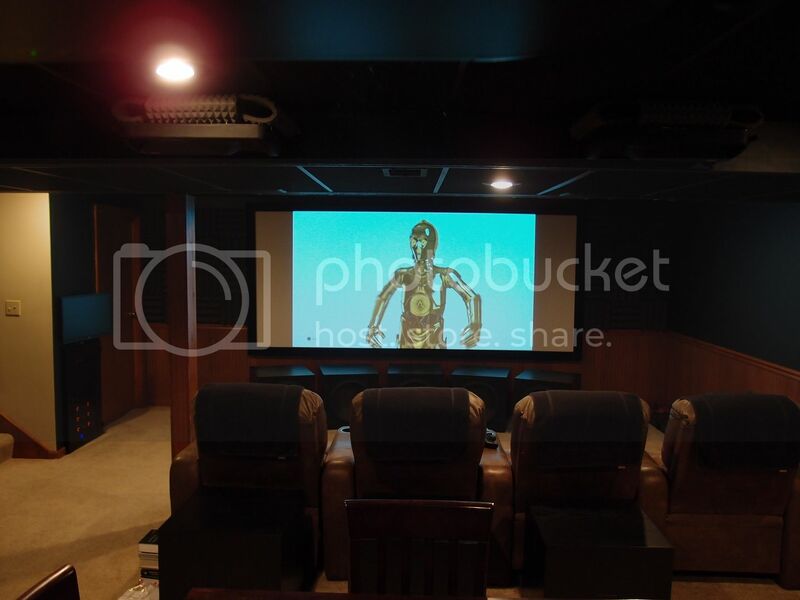 I'd put the JTR 228HT front soundstage behind the AT projection screen. I have six subwoofers. Two JTR Captivators and four 22" sealed cubes holding yet unchosen 18" drivers. One thing I really enjoy doing is hosting audio meets and demos for fellow enthusiasts. Ideally the AT screen will allow me to do blind comparisons of gear for friends and enthusiasts. My seating area, for the front row is in the 12-13 foot range from the wall. I'm not sure if my room will support a second row or not in the current arrangement, based on the lower HVAC duct dropdown. My ceiling height 89" and only 81" where the HVAC ducts hang down in the center for the room. My Projector is the inexpensive Epson 8350. My screen is yet unchosen, but I'm considering Seymour XD, or UF, or open to other suggestions like Falcon or anything really at this point. At some point I would like to purchase a new Panasonic or JVC projector for the automated zoom function with the 2:35:1 screen concept, but that's a future intent. I'm playing with screen sizes using tape on the wall as a frame of reference. From my seating position about a 120" or 130" 16x9 screen is about as big as I can use in my room. 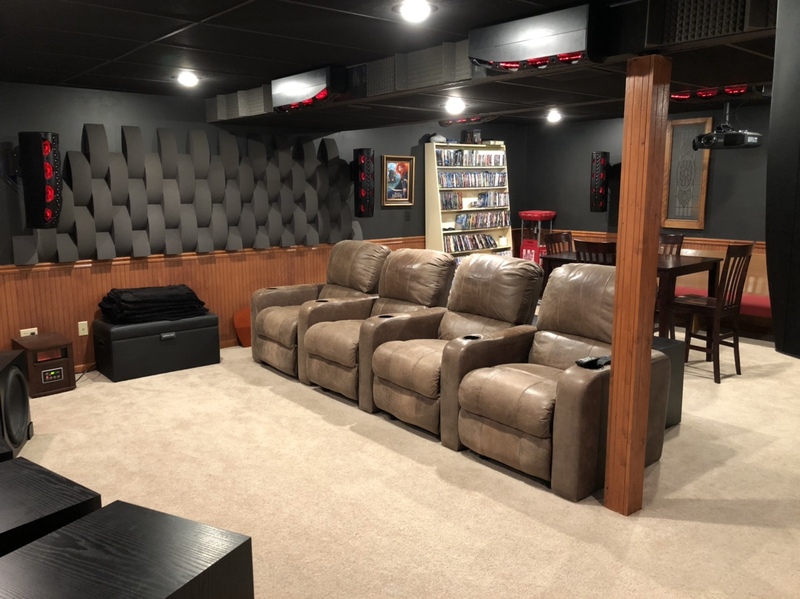 I may want to place the subs below the screen - so with a 89" height room, I'd need to keep the screen size limited to about 60" tall to both have room for the subs under the screen and keep my feet from barging onto the screen real estate when reclined in the Berkline recliners. You can see my old home's multipurpose theater space in my signature. I do like dark walls, and dark ceiling to help with projector contrast. My new home is very much light controlled. There is only one window in the room and it can be tinted out as it is already just frosted cube glass and not useful for looking outside anyway. I enjoy playing Xbox 360 games, PS3 games, PC games, and Internet browsing and such on my projector as well as watching movies or listening to music. It's probably a 50/50 split between game playing/PC use and movie watching or dedicated music use. No more talk from me. I'll throw up some pictures and read some of the initial suggestions from you! Please excuse the mess - we are still moving in and getting situated. Only 1 of the sealed 22" subwoofer cubes is up front, but I have three more. 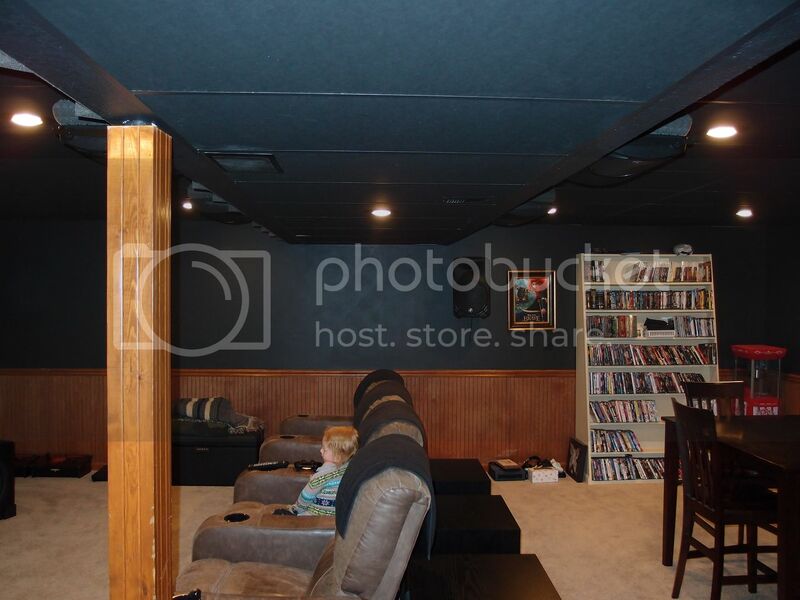 (4 total) I'm undecided if I would put the subs under screen, spaced around room, or behind AT screen. Future measurements will help with that decision, but I want to keep at least about 25" below the screen in case I decide to place the four sealed 22" cubes below the screen. black tape marks 16x9 with 60" height viewable. In my playing with this size, I almost feel like 2:35:1 content is borderline too large at this size, so I may have to size down the screen to 56" height and try again. My current 16x9 screen (seen along the wall in the pictures) is a DIY job made with JoAnn's black out cloth made for the old house. It is 106" diagonal or 52" height. I do not feel it is too big from 12' away - in fact it is just about right or maybe a couple inches smaller than my most ideal preference, but 60" may be a bit big - especailly in the 2:35:1 zoom picture to me... So maybe 56" high might be the next tape placement for the CIH screen that I try. Or I may just try moving my seats back a foot or two more. I thought I read that the ideal setting is keeping the prime money seat in a equalateral triangle with the left and right speaker. So if my seating is about 12 feet back from the screen, then ideally my screen should be about 12 feet wide (or a bit wider) in the 2:35:1 mode. I think I'd like to put my left and right speaker behind the AT screen if it is at all feasible - so that my entire front sound stage is behind the AT screen - but if that doesn't work I can just cover them with speaker cloth on the baffle wall and they could reside outside the image. I've attached the Carlton Bale calc for projector information. All the blue fields are filled out with the information from my room and the XLS doc helps you plan for screen sizes, brightness levels, FOV, etc. Last edited by Archaea; 10-05-2014 at 09:44 AM. You DID move. Non text message replier. Are you going to use an anamorphic lens? If not and using the zoom method a 2.35:1 has 33% of the vertical resolution off screen and you have 1920 x 811 active pixels for your calcs above. Will be cool to see this come together. Like the new theater space and home. With a little work, you have the potential of having one of the most epic baffle walls...ever. Scott Simonian, chirpie and evan1242 like this. I replied! non text receiver! I probably won't consider an A lens unless I find some stellar deal on one. After some additional projector time spent I'm thinking of going a bit smaller (like you advised in person). Perhaps a 56" tall CIH image. Actually my old 16x9 106" DIY diagonal screen doesn't bug me when I put it up, so I may just got a smidge bigger in the 2:35:1 format. I put up a wanted add for a Panasonic 8000 projector so I can have the auto zoom/focus function. I bought some acoustic panels - OC 703, and rock wool stuff on craigslist. The cloth coverings were not to my taste, so I'll have to recover, but at least I have some absorption panels to play with. Subbed. You've always given good info on audio, can't wait to see what you do with the new space. Also...When I was last looking a Panny AE8000 could be had for under $2000 with specials direct from Panasonic. "Damn, you can't get black levels like that on your projector!" - My brother, just before he realized his LED display had died. If you're sitting at least 11-12 feet away, then I would recommend the XD. It's brighter than the Falcon by about 10-15% (when compared side to side), although the Falcon disappears at about 8 feet. BTW: Are you going to build a riser? If so, how high do you want to build it? I too am now trying to figure out sceen height (so as not to see my feet when reclined), and also how high the second row's riser should be. Thanks for the info coolgeek. The calculator in the second post of this thread has some tools that let you help determine seat heights - scroll to the bottom of the first tab. I put my Epson 8350 and 106" diagonal 16x9 screen up on craigslist two days ago. A guy already contacted me and said he thinks he'll take the package - screen, projector, and mount, but wants to see them first. If it sells I'll probably either buy a JVC or Panasonic AE8000U (only options I'm aware of with autolens memory in the budget projector range) and get a 2:35:1 screen. 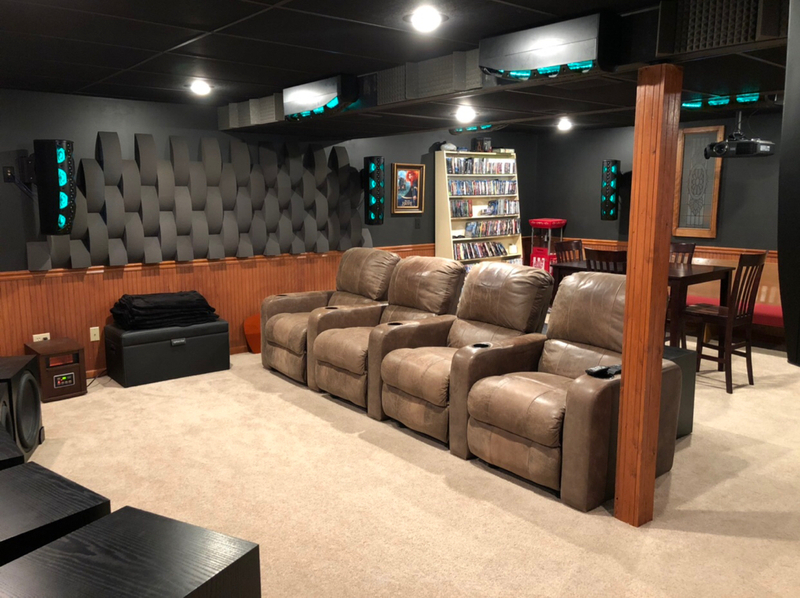 I'm thinking about a CIH acoustic transparent screen with about 54" or 56" of height is going to be about right in my room from my seating space --- after playing around with a lot of different sizes (taping borders and watching movie clips) over the last couple weeks. Subbed! The room has so many options. Can't wait to see what you do with it. I've been wondering which surround speakers I'm going to go with in this room. I'd like matching JTRs for all surround channels, (ideally I'd put 228HT everywhere) but I really can't afford to finish up my setup with JTR unfortunately, and I'm really just happy I was able to purchae the front sound stage of JTR equipment (three 228HT, and two Captivator subs). The surround 'quality' isn't as important to me as my front sound stage. I currently have a set of Klipsh RS-3, but they fall behind the JTR 228HT quickly as the volume goes towards reference. So I'm wanting to explore options for six high sensitivity speakers to use as front wides, surround, and rear surround. If eD was still around I'd probably pick up six of the eD cinema 6 speakers or something along those lines. Have you considered any of the SEOS offerings? I thought someone talked about the pro jbls for surrounds with some of the jtr speakers. In fact the featured ht this month has them for surrounds I think. First 2 things I'd look at, personally. Sold Epson 8350, 106" 16x9 screen, and Chief mount for $1150 on craigslist. Purchased a third Infinity Kappa Perfect 10.1 (still looking for one more) to make nearfield subwoofer transducers immediately behind my berklines. I really like the effect. It beats the buttkicker transducers hands down. eBay is running 25% off some of their subwoofer enclosures - spent a bit of time looking for a good pre-made match to stand up with a slant and aim into the rear of the berklines. I want to use sealed, because ported 10" enclosures are typically tuned way too high for my preferences in home theater. The Infinity Kappa Perfect 10.1 is a beefy driver, so it oughta handle sealed nearfield duty fine with some boost applied from my inuke DSP 3000. If this works out well I'll be selling the four LFE mini buttkicker transducers. Need to purchase a projector mount for the AE8000U and I want a nice solid one. I would like to purchase a set of matching surrounds. I've been watching ebay for some used JBL cinema stuff. I don't think most of the Klipsch stuff could keep pace with my JTR 228HT front soundstage. I still need to figure out how to do front wall. Probably doing a baffle --- which type of wall cover is still to be determined. I'm going to try to go dead front, live rear model for my room. I highly recommend the OmniMount 3N1-PJT. I'm going to try to stay away from any ball mount type projectors this time. I'm tired of them slowly moving with bass vibrations and requiring re-adjustment. I want one with set screws. Probably something like one of the chief mounts is my target. My old mount has set screws. I will find it after work and send you some pics if you are interested. I still think the OmniMount works way better though. Will stand them up on end firing into the back of the Berkline chairs at an angle to introduce more tactile feedback into my chairs. two subs will be powered on each channel of an iNuke DSP 3000. Dynamic boost will be used to boost the lower frequencies more at lower volumes. How about the Volt-10s sealed as surrounds? That looks nice...like a place I could hang out in all day long! Sometimes the formal theater seats, etc seem stuffy to me. I have always liked the casual classic look of bead board, especially painted dark like that for that setting. My Panasonic AE8000U came in yesterday. It's a nice upgrade from the Epson 8350. 144" 2.35:1 Jamestown AT Screen with Seymour XD screen is supposed to come later this week. Here is my initial impressions mini review. I'd like to coat the entire front wall of my theater room with dampening materials making for a dead front, live rear acoustic treatment sound, and since I have the screen and projector and mount - it's getting closer to time to pull the trigger. I've been to a LOT of home theaters from different members on this board and the dead front, live rear has been my favorite acoustic model. I have 89" ceiling height and a 218" front wall length. So I'll need to coat the entire front wall I think. I've seen this Aurlex Platfoam is recommended to coat a front baffle wall. I also see some people using the 12 or 24" styled foam pieces. What other options do people recommend to coat a front wall with? It's a big space to cover - so functional budget recommendations are all the rave! The used 2.35:1 144" Jamestown screen with Seymour's XD fabric came in. I got a good price on it, but I don't think I'd buy a used Jamestown screen again. The previous owner had cut off the extra tab material and putting the screen together took more time than it would have taken to just staple it on DIY. I literally spent about six hours tying to put it together with my wife. The tabs were cut short enough that after multiple failed attempts we had to use several sets of needle nose pliers to pull the tabs out taught enough. Even now there is barely any fabric hanging out of the tensioners. I'll admit I am not a fan of that tab system and the tabs being cut short by the previous owner was just a lesson in frustration. I bought grommets and was going to redo the system on Gorilla83s advice, but my wife said she wouldn't help me anymore if I was going to start all over. We were both frustrated. But hey..... It's together now. We also painted the front wall black for the AT screen purposes. With the wall white too much reflection was coming back at the screen from the back and contrast suffered. I think this is typically done and I understand why. Still trying to figure out exact screen placement. Do I center the speakers towards the second seat and basically have three good seats with one sweet spot and one trash seat against the wall, or do I center the screen and speakers in the middle of two chairs and have no sweet spot but two good spots and two okay spots and no trash seat. The second option with two good spots was how I had in my old theater, but my friends were always getting after me saying you need a sweet spot for music. I tried it and didn't care that much about it. 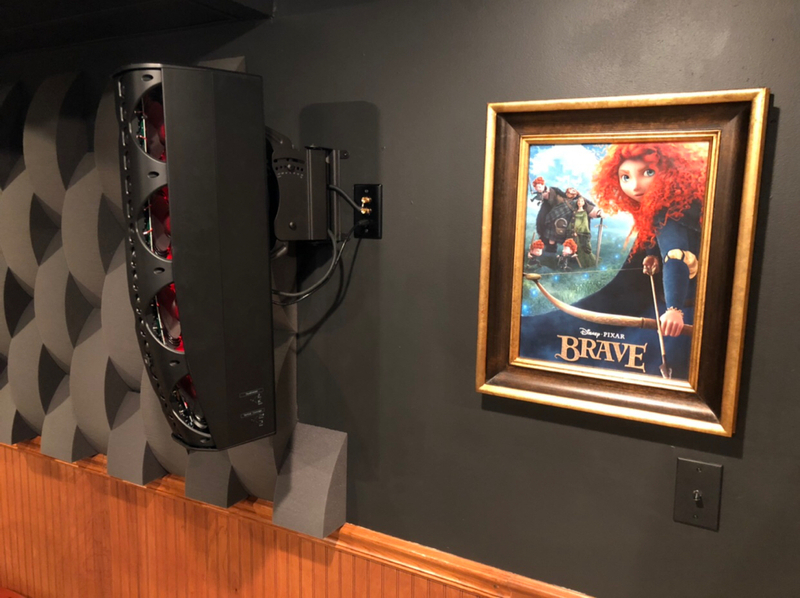 I like music in and out of the sweetspot with my JTR 228HT and I'm primarily movies and game intent with the projector setup. I vote no sweet spot so all seats are good to great. I am sure most will disagree with me though. Also, the Jamestown frames are a PITA even with the full tabs. Sorry you had to install them without full tabs. That really must have sucked. You have my sympathy, man. Then staged the speakers below the screen to get an idea of how it would sound before cutting into the wall. Then watched The Prestige last night - it's a fantastic movie! Really makes you think! This was my second time so I really enjoyed getting to pick up on all the clues I missed the first time - since I knew the ending. The 144" 2.35:1 screen is a 'touch' too big, I initially thought, but by the end of the movie I didn't mind at all. I might consider moving the chairs back another foot or so. Speakers on the ground are no good - so I'm not sure how much my soundstage testing is really telling me about anything. But it let me look at spacing at least. Still deciding if I'm going to take the wainscoting down throughout the room. I actually like the way it looks with the Black wall. I also am trying to decide what to do with the ceiling. Replace the panels with AT ceiling panels and pink fluffy? Replace the drop ceiling and put drywall up there? and what color to pain them. How do you recommend painting the drop ceiling grid -- the same color as the 2x4 panels? Or a slightly different color to offset? I'm also trying to decide also If I want to paint all the room black like the front wall - or the adjacent walls, or leave it as is. My screen is about 25" off the ground so that gives me clearance for my 21" subwoofer cubed boxes or the captivators laying down sideways like they are now at 20" high.